I can’t believe it’s already August today! This summer is flying by! I recently spent a week up in the mountains with my family this last week, where we stayed at a huge lovely cabin and lounged by the pool during the day and got in some volleyball playing too! Needless to say, I saw lots of Sun – probably far too much (if there is such a thing!) But I took some of my Korean Beauty Summer Must-Haves to keep my skin protected, hydrated, and soothed. The May New York Super Clear Pure Sun Stick SPF50+PA++++ is my absolute new favorite sunscreen! I’ve always struggled to find sunscreen that didn’t make my skin look oily and greasy, or even worse- makes me break out! And I’ll be totally straight with ya here if you’re open to it, I hardly every re-apply sunscreen to my face when I’m out and about? Why? Because unless you’ve got a mirror or a kind friend to help make sure your sunscreen is fully rubbed in, you’re most likely going to end up with those unsightly white streaks and no make up is going to help the greasy look that sun screen just gave you now! The May New York Super Clear Sun Stick absolutely solves ALLLLL of these problems ladies! The sunscreen is clear (not white) and goes on as such, so no streaky white residue! Yep, you can easily apply on the go, even without the mirror or the friend – and you won’t have to worry about your sunscreen not being rubbed in completely. Best of all, it doesn’t make skin look oily or greasy either! You can apply it over or under makeup too! I’m obsessed with this sunscreen and you can bet I will be keeping stocked up on this stuff all year round! Once I’ve spent the day in the sun, I wash my face with my Graymelin Vintage Oxygen Bubble Mask Pack. This fabulous bubble mask works as a cleanser and deep cleans even the dirtiest skin and removes even the heaviest makeup (and sunscreen!) The bubble mask cleanser is super soothing and feels really nice, calming, soothing and gentle on even the most sensitive skin. It works great for skin that may have got a little burned and is irritated, red, and itchy. The oxygen bubble mask lightly bubbles up on the skin, removing dead skin cells while cleansing the skin. Simply rinse once the cleanser has foamed up, and skin feels refreshed and super hydrated, and has a beautiful nice glow to it as well! Last but not least, I finish with my Graymelin Special Natural Balance Aloe 90 Soothing Gel. Just like the name states, it contains over 90% aloe vera leaf extract- so it’s the perfect moisturizer to soothe irritated, red, sun-burned, skin. The moisturizer is so incredibly hydrating, it works as a great daily moisturizer whether you’ve seen lots of Sun or not! The moisturizer calms and soothes irritated, exhausted skin while creating a moisture barrier to keep skin hydrated, smooth, soft, and supple too. It is lightweight and clear and quickly and easily absorbed into the skin. It feels refreshing on the skin and unlike many products containing aloe vera, it isn’t at all sticky or goopy! Even after spending all day, every day in the sun this last week, my skin never burned or felt irritated, and instead felt super hydrated, smooth, soft, and super supple too. 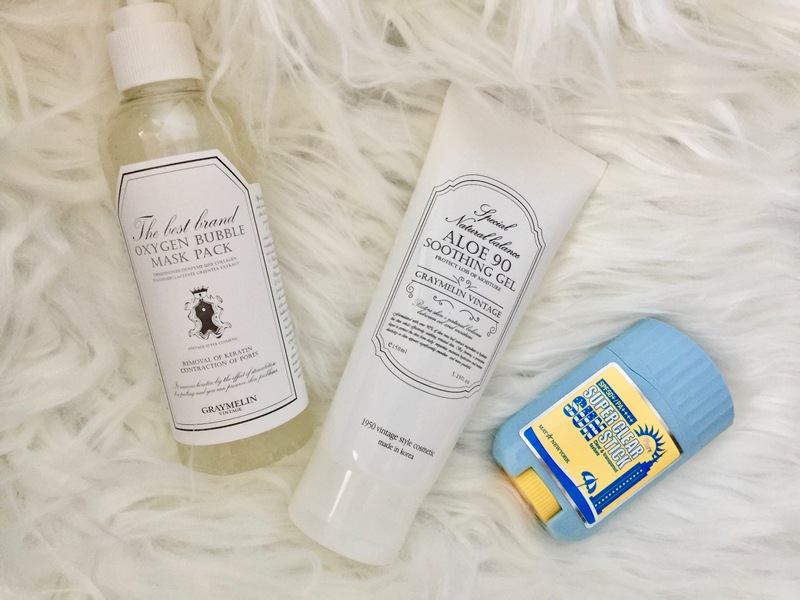 I love that thanks to these fabulous Korean beauty summer must-haves, my skin didn’t have to pay the price for my love of sun and the summer! Want to try it out for yourself? Check out these products Here on Amazon! Which of these products are you most excited to try? Let me know in the comments, I love hearing from you! I love Korean products. They’re always super affordable. I haven’t heard of these kbeauty brands before. Thanks for the introduction! Thank you for sharing. I would love to try out this product.